Obsidian Vineyard nestles in the coastal hills of the Onetangi Valley adjacent to the northern coast of Waiheke Island. Here, small batches of wine are grown on four discrete hillsides set out in an amphitheatre-like fashion. The sheltered vines enjoy high levels of heat summation, tempered by the maritime breeze. The mineralized clay soil is rich in iron and manganese oxides, and overlays ancient weathered rock. These conditions perfectly suit the noble red and white grapes originating from the Mediterranean countries. The vineyard was originally planted in 1993 with the single objective of producing a great Bordeaux-style red. Since then the 10-hectare of planted vines, with its four distinctive blocks, has seen many changes with new varieties planted and although producing a stylish Bordeaux-style red remains a significant focus at Obsidian, other new and innovative grape varieties have been introduced. Up until 2000 the only wine produced by Obsidian was a Bordeaux-style red. In 2000 a second label or “little brother” to Obsidian was introduced called Weeping Sands. It wasn’t until 2004 that Obsidian produced its first non Cabernet Blend wine – a delightful summer Rose made from merlot grapes. Since then, new single vineyard wines include Syrah, Montepulciano, Viognier, Chardonnay and Tempranillo have been planted. They are small in quantity but high in quality. Obsidian is the first vineyard on Waiheke Island to produce a Montepulciano and Tempranillo. In 2012/13 the Weeping Sands brand name was replaced with Obsidian non reserve label, simplifying the overall brand. Our decision to change was not made lightly, but it helps the winery focus on its core brand name, and simplifies promotion and marketing. The company has registered and will retain exclusive use of its alternate brand names including Weeping Sands, Black Glass and Yellow Clay Road for other potential applications. 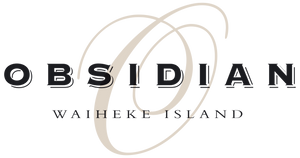 The traditional - existing Obsidian label will now become Obsidian Reserve, to include a series of five wines: "The Obsidian", "The Mayor", Syrah, Chardonnay and Viognier. Design changes are evolutionary and the new labels will be recognisable as Obsidian when seen alongside the old labels. Our approach to viticulture and winemaking is uncomplicated. We strive to grow consistently ripe, concentrated, flavourful grapes and to craft them into superb wines for drinking and cellaring. Yields are kept deliberately low to maximise quality. As a result only a limited number of cases of Obsidian are produced each year, though this varies naturally with the vintage conditions. The combined annual production of Obsidian and Weeping Sands is typically about 4000 cases. Family of classic red and white varieties originating from the Mediterranean countries. Single vineyard production of innovative varieties. To make wines exhibiting technical qualities, balance and vibrancy which will cellar with promise and are vinified first and foremost to match well with food. We're often asked how Obsidian wine came to be named after a semi-precious stone. The story began shortly after the vineyard site was purchased in 1996 when Lindsay Spilman started reading about the history of Waiheke Island. Lindsay discovered that obsidian was highly valued by Maori tribes living in Onetangi, close to the site of the present day vineyard. Although the stone isn't found naturally on Waiheke, it was highly sought after by the Maori for its sharp cutting qualities and glass-like structure. It was obtained from deposits found principally on Mayor Island, and also from other islands in the Hauraki Gulf and from the central North Island. Obsidian is still in demand today for its distinctive colours (black, mahogany and rainbow are some of the familiar ones) and its suitability for cutting and polishing into gems, jewellery and other artifacts. There are many volanic sources of obsidian, and interesting objets d'art are made from it in Africa and Central America. The historical connection with the vineyard location, as well as Obsidian's attractive qualities, fascinated Lindsay. "The main coincidence is that the deep, lustrous colour of the stone is exactly how we want our wines to be described" says Lindsay. "And there's a sense of individuality about it, as well as an enduring timelessness. These are the qualities we're seeking in our wines". Weeping Sands owes its evocative title to a Maori legend. It’s a literal translation of the word Onetangi, the name given to the beautiful beach close to Obsidian Vineyard on Waiheke Island, the home of the Weeping Sands range. In the Maori language, ‘One’ means sand and ‘Tangi’ means weeping, murmuring or mourning. In 1821, many members of the local people perished when Hongi Hika, a warrior from Northland, laid waste to the island. It’s said that soon afterwards the beach became a place of pilgrimage and mourning, which is how it acquired its name. Today Onetangi Beach is once again peaceful and unspoilt, but here and there tiny streams of fresh water can be seen trickling gently over the sand towards the sea, reminiscent of tears across a cheek. Weeping Sands wines are a vivid reminder of a stormy period in history and the legend that has grown up around it.